So, the one of the great joys of photography, for me, is the perfect convergence of art and craft. Every frame is an opportunity to blend vision with technique. The greatest images will almost always have peerless technique combined with a novel way of seeing. Naturally, there are exceptions to every rule, and photojournalism is one of them. Sometimes, camera settings have to take a back seat to just being there. Being able to get the frame, any frame, is the important thing. And hopefully, there will be time to shoot again, do it better. One of the things I’ve learnt over the years is just to always be ready. Get your camera set for the next shot, whether you know what that shot is or not. But weddings are not always 100% action. Late in the evening, you can often find a couple of minutes to, well, play. Play with lights, with OCF (off camera flash), whatever you have to hand. Take the time to set things up. To exercise some craft. Try some different techniques, and create some arresting images. Let’s talk about one technique I like to use, given time and the right location. It’s probably best described as drawing with light. There’s a lot of room for experimentation – different light sources, patterns, using sparklers or even twirling fire, but the basic techniques remain the same. 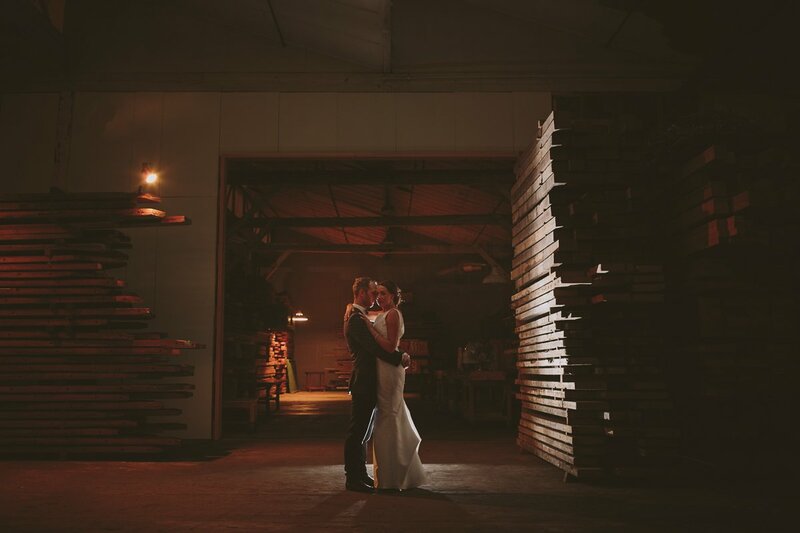 The equipment you will need should be pretty standard for any wedding photographer. It’s gear I always have in my boot – I may not always need it, but I would rather have it and not use it than the other way around! 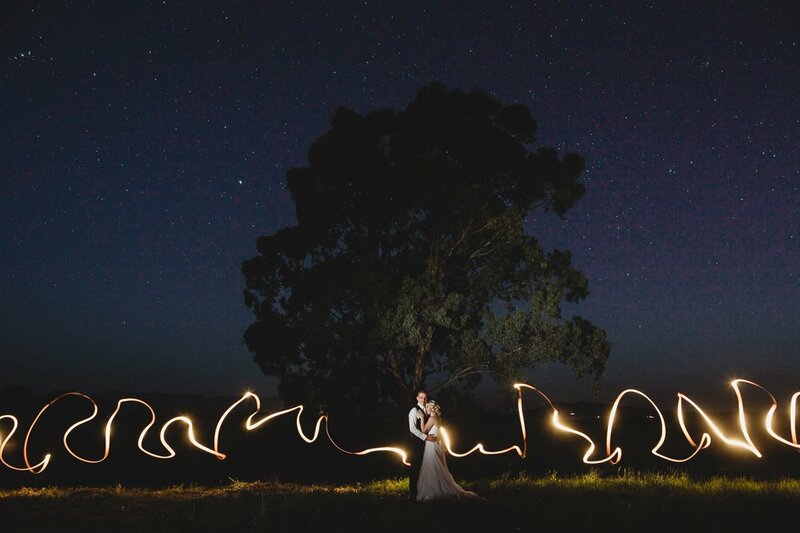 You will need a light stand that can hold a flash or strobe, a small, dimmable LED (or sparklers, or a torch, even an iPhone could work! ), a reasonably sturdy tripod and a remote firing system for your flash. I use Canon EX600 – the built in radio triggers are brilliant and easy to use. I’m going to go right ahead and assume you’ve got a camera and a lens. First, you need to find a dark location. If there is enough ambient in the sky or background to register, without casting light on the subject, that’s perfect. Put your camera on the tripod – you’ll probably want to use a widest lens here, and compose the image. I use an intern (alright, a wedding guest, usually) to help here. Two sets of hands makes things run a lot smoother – every shot you see here involved someone firing the shutter for me. 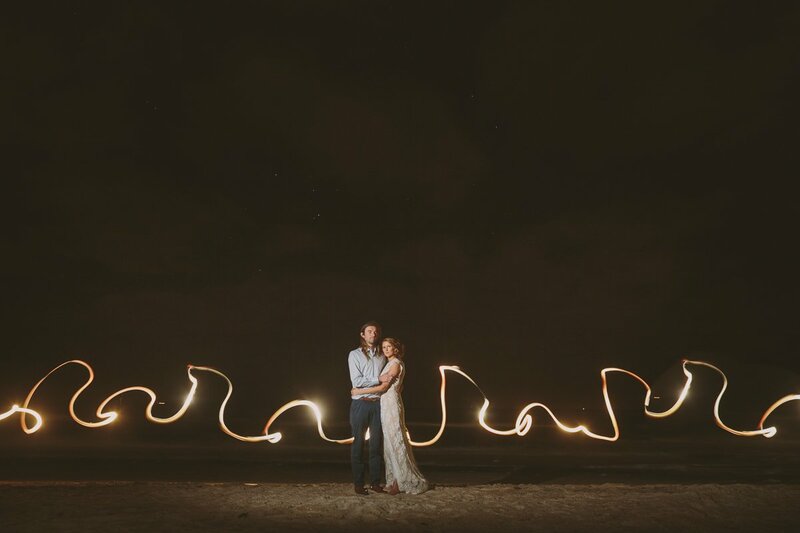 Get your assistant to shine a light on the couple, focus, and lock focus by switching the lens to manual focus. Next, we want to get the couple lit. I will often try to do this in advance, using any convenient model (my unpaid assistant/guest again!). Set the flash on the lightstand, and aim it slightly above the heads of the subject – you want to ‘feather’ the light from it, to soften it and reduce obvious shadows. This is often the trickiest part – you’ll be working in the dark, and the flash should be raised up pretty high on the stand. If you can zoom in your flash head, do it – I normally zoom it to 80 or 135mm – helps to aim the light where you want it, which is on the subject only. Once the flash is aimed, test your exposure. 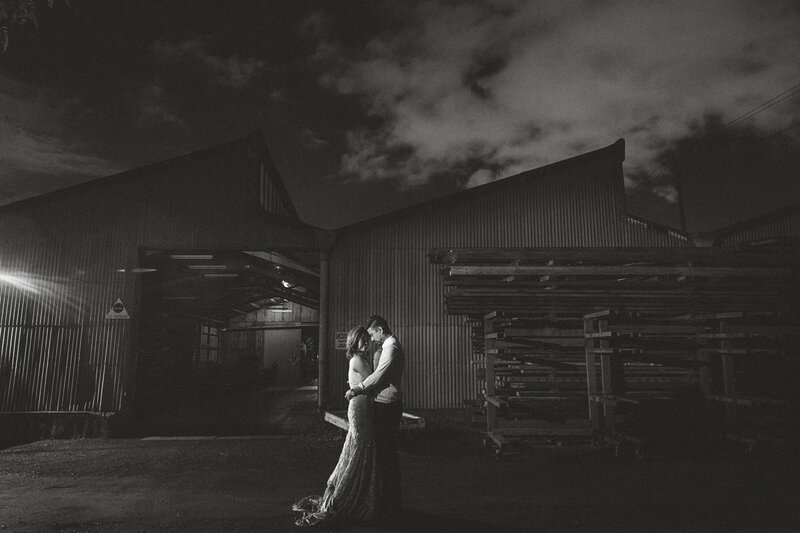 This is going to be super variable, depending on ambient light, how long you want to keep the shutter open for, and whether there is any light on the couple. It can be tricky to trouble shoot – I had one experience where I could not figure out why the couple were getting double exposed in every frame. Turned out that they were getting swept by car headlights from a nearby corner, so careful timing fixed it. I find that around 10 – 20 seconds exposure, ISO100 and the flash at around 1/8th power is a good ballpark. This is where you need to have a way to trigger your flash remotely. In a pinch, you can get an assistant to hold it and fire it manually, but a nightstand makes the results repeatable. Nearly there. 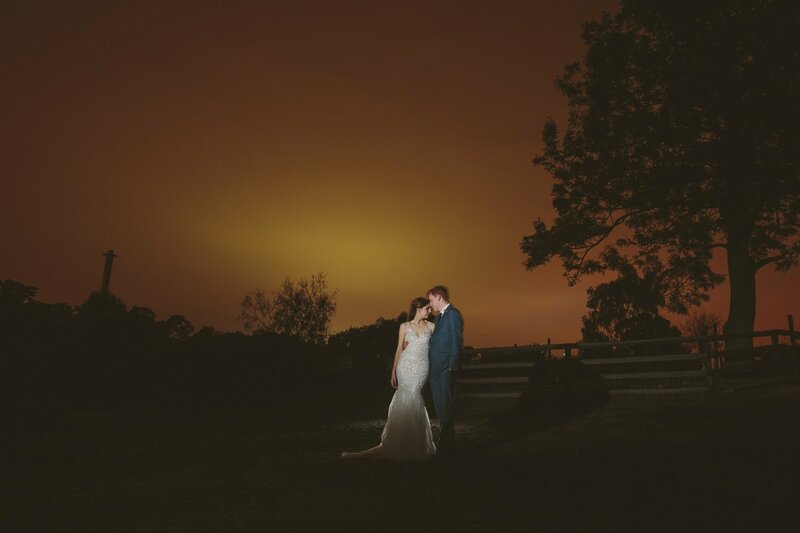 Flash aimed, couple in position, intern standing by the shutter. Camera tripod mounted, focus locked, and subject carefully framed. 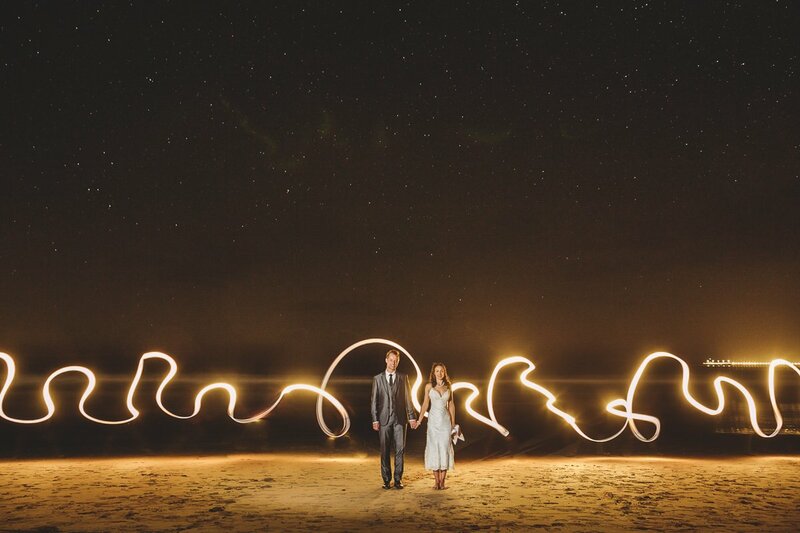 Get in position with the LED (or sparklers, or whatever) behind the couple. I usually dial it right down, but occasionally having a stronger glow can add to the image – check this beach shot to see what I mean. Get you assistant to fire the shutter, and GO! Start running, jumping, crouching and waving your light around like a madman. Always keep moving – you do not want to register on the image. Become invisible through constant motion. Also by keeping the light aimed AWAY from you. Keep moving until you’re out of the frame, then go check the results. Adjust anything if needed. Do it again if you have to. You can still use this technique even if there is a lot of ambient. 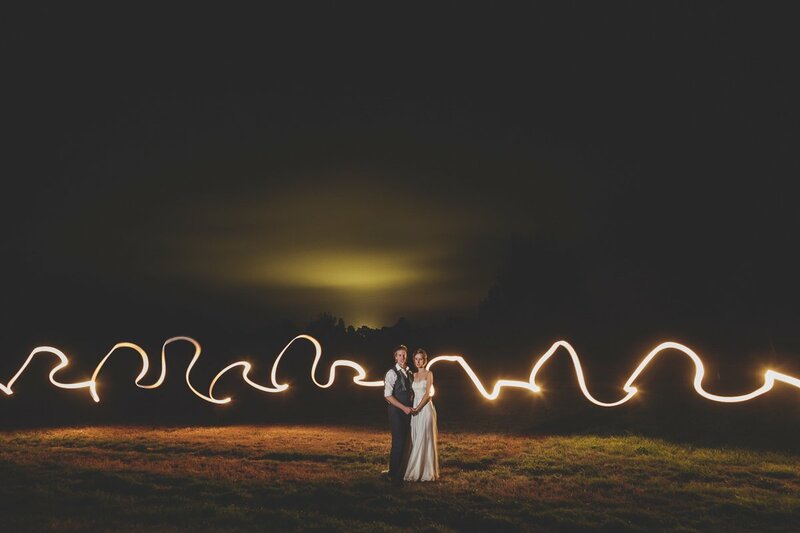 Drop the shutter speed, and don’t worry about running around with the light. Once you’ve got this down, go crazy. Try different things. Light the couple from behind as well, or solely. Drop the flash exposure for a darker, more intense look. Draw patterns, or words. Have fun. Also, be safe – try not to break an ankle running in the dark!